This individual Report The Global and US POS Markets: Forecasts and Futures is available for purchase. This Report is available to members of Mercator Advisory Group’s Emerging Technologies Advisory Service. Please be advised that this Report is normally part of a research and advisory service that provides ongoing support throughout the year. As such, this Report contains significant depth of content that is selected for its strategic importance to our members. (For a description of these services, see our Advisory Services section). Mercator Advisory Group is pleased to announce the release of its latest report, The Global and US POS Market: Forecasts and Futures. For payments professionals at financial institutions, merchants, payment processors and others needing to understand the POS terminal market, this new report reviews global and regional POS terminal shipments and approximate revenues and looks at the future role of POS terminals in the payment ecosystem. In particular, the report reviews and forecasts global, North America, EMEA and Asia Pacific, and Latin America shipments of POS devices from 2002-2011. The report discusses the pressures operating within the POS terminal market and looks at the varying strengths and strategies of POS hardware makers and VeriFone, Ingenico, Hypercom, ExaDigm, WAY Systems, VIVOtech and others. The report concludes with a discussion of upcoming structural shifts in the US POS market as network-centric services assume a greater role in the payment processing value chain and how this shift may benefit the processing community. Evidence for this shift is examined. A table of planning recommendations for both Tiers 1&2, and Tier 3&4 merchants is provided. 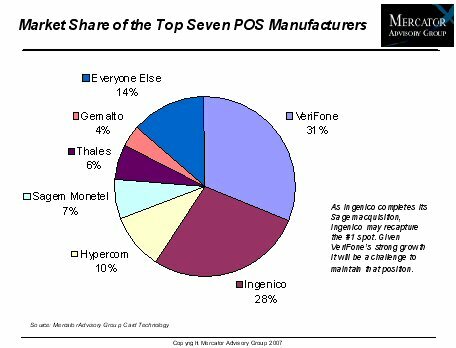 Consolidation continues in the POS terminal manufacturer ecosystem with top spot shifting between Ingenico and VeriFone. VeriFone's increasingly potent execution within its R&D and manufacturing operations have improved operating margins, giving it even more market power. Global POS terminal growth will reach 15% in 2007 although a reduction is expected as the US economy cools over the next 18 to 24 months with the concomitant impact on the global economy. The report revises 2006 industry revenues based on public corporate disclosures and estimates. Longer term, the ability to deliver value-added services to merchants via network-based applications poses a challenge to POS manufacturers, one that requires a stronger niche focus and a diversification of revenue streams. "POS market consolidation reflects the increased cost of bringing secure POS devices to market and the realities of a somewhat commoditized market. Economies of scale and global reach make it difficult for niche players to prosper," comments George Peabody, Director of Mercator Advisory Group's Emerging Technologies Advisory Service. "The US POS market at the beginning of a network-centric transition that will challenge existing POS device revenues streams." One of the 11 Exhibits included in this report. This report is 35 pages long and contains 11 exhibits, and 3 tables. Members of Mercator Advisory Group have access to this report as well as the upcoming research for the year ahead, presentations, analyst access, and other membership benefits. Please visit us online at www.mercatoradvisorygroup.com/. For more information call Mercator Advisory Group's main line: 781-419-1700 or send email to info@mercatoradvisortygroup.com.